After nearly 3 years, this is my final post for 3 Girl JAM. It has been a glorious ride, full of learning, friendships, and lots and lots of crinkle ribbon! It is with heartfelt thankfulness to Julie, owner of 3 Girl JAM, that I write this final post. The image on this card is from PPinky Dolls Art. I colored her with Lyra Rembrandt Polycolor Pencils on Kraft paper. Designer papers are from DCWV. The sentiment is computer generated. The rich, cocoa brown ribbon is from 3 Girl JAM, of course! It's the Hot Chocolate ribbon from the Hot & Cold Bundle. To give it just a bit more sparkle, I added a bow of Silver Cord from the Holiday Trim Bundle. Be watching the 3 Girl JAM Facebook page to hear about some upcoming specials that you won't want to miss! I promised to announce the winner of the 3 Girl JAM ribbon bundles from Emily's 16th Birthday Blog Hop today. Chosen by Random.org, the winner is Sunshine Honeybee! Congratulations! Please leave me a way to contact you to collect your prize. 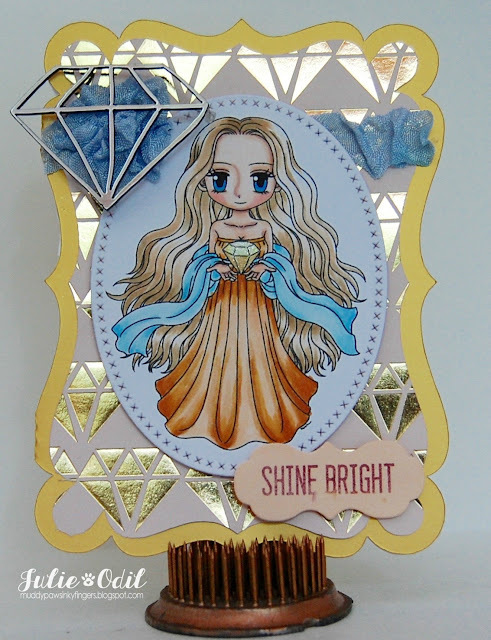 It's time for a little mid-challenge inspiration over on the Oddball Art Challenge blog. Our theme for this month-long challenge is 'Christmas or Winter Holiday.' I don't know about you, but about this point in the season, I'm ready for a bit of normalcy to my routine. Get these decorations down, quit messing with my schedule, and let's get back to the status quo. Bah Humbug! Those thoughts were the inspiration behind today's card for the 'Christmas or Winter Holiday' Challenge at Oddball Art Challenge Blog. This cute and quirky image, #143, was colored with Copic markers. Designer papers for this card are from Michele R Designs digital papers. The sentiment is from Close To My Heart, cut out with a die from Paper Wishes. There's a new Oddball Art Facebook Challenge starting on January 1, so check that out! Need/want a new image for the challenges? Use discount code DTJULIE10. It will save you 10%! Go shop! Where I come from, and with the people I hang out with, comfort is much more important than fashion. That's why today's New Release from The East Wind is so appealing. Unky nailed it with her interpretation of "the hoody". This garment is a fashion must-have here in NW Wisconsin. Bring on The East Wind's New Release -- 'Bunny Hug'! I colored 'Bunny Hug' with Copic markers. A die company is going out of business, and this is one of the new sets I got from them. I used the largest heart in the die set and made it into a heart-shaped card base. I inked the edges of the scalloped die with Tim Holtz distress ink in Wilted Violet. Papers for this card are digital. They are by Michele R Designs. The sentiment was computer generated. That's it for today's new release. On Friday, there will be a Freebie for anyone signed up for The East Wind's newsletter, plus another new Release. Two delights to look forward to! I have 2 cards that I made this morning for 2 progressive challenges. I'm going to share them together in the same post. They are the last of the Christmas cards for this year. The first, using a Gerda Steiner image, is for her progressive challenge. I used her last month's progressive image, so got this one for free. I've been participating for quite a few months now, and am trying to keep the streak going. I love GSD artwork! 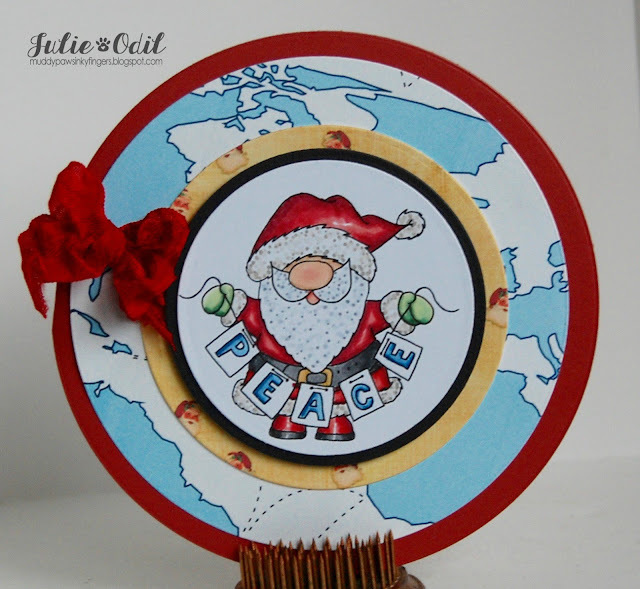 A colored Peace Santa with Copic markers, then used a variety of Lifestyle Crafts circle dies to create the card. The designer papers are digital. I found the map paper at Pixel Scrapper. It was in a pirate collection. The Santa paper is from Decosses' Dynamite Doodles. The crinkle ribbon is from 3 Girl JAM. The second card is for The Outlawz Progressive Challenge. I am proud to say I managed a card each month this year. Woot! We started and ended the year's challenge with an All Dressed Up image. She is so endearing! I colored Happy Christmas, Little Star with Copic markers, then used 2 sizes of a Die-namics die to cut her out and back the image. The card design was cut out on my Silhouette, using a cutting file from Pretty Paper, Pretty Ribbons. Designer papers are from American Crafts, Shimelle 6x6 pad. Merry Christmas to you and yours. May you find peace and quiet family time together. Dec. 23 -- we're getting very close to Christmas now! This is also the start of this week's challenge at Inspiration Destination Challenge Blog. The challenge is always Anything Goes. This is my last posting for IDCB. I'm taking on some other commitments beginning in January, so some things had to give, and this is one of them. I have thoroughly enjoyed working with Ema and her team. One of our sponsors this week is the wonderful Polkadoodles. I just love this festive image! The image is called "Twiggy and Toots - Christmas Wishes". I cut the image out with a Spellbinders die in 2 sizes. The treat bag and glimmer trim are from Close To My Heart. Join in on the Anything Goes challenges at Inspiration Destination Challenge Blog, and if you are looking for a great team to be on, there's a DT call going on now. 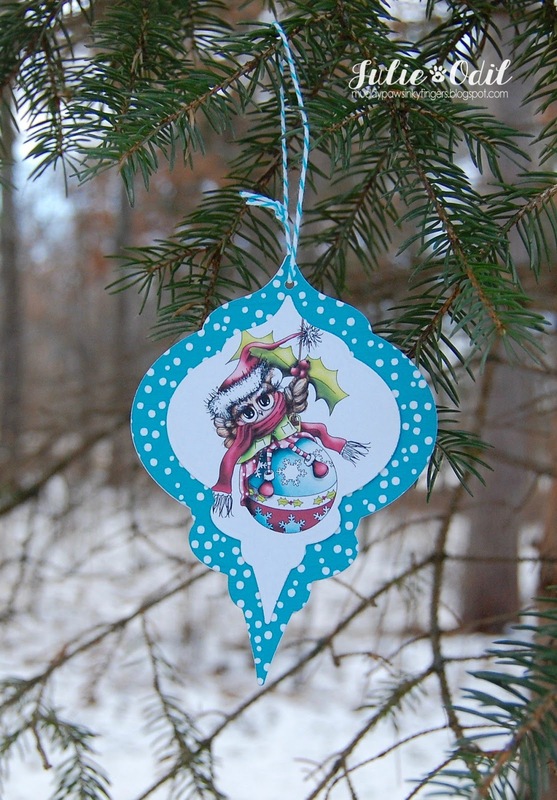 The images are from one of this month's sponsors, Pickled Potpourri Designs. This is Jingle Jolly, and it includes both Santa and his reindeer. I colored them with Copic markers. The sentiment is computer generated. Designer papers for this card are from Decosse's Dynamite Doodles. They are part of her "Santa is Coming" collection. No matter what you believe, may this Christmas bring you some peace and joy. I hope you can join us yet this month for our challenge at Path of Positivity. The theme is "Believe". Today starts the final challenge of the year on the Lacy Sunshine Challenge Blog. Our theme, for the next 2 weeks, is Christmas Confections. There are MANY wonderful image in the Lacy Sunshine store that can be used for this theme. If you use a Lacy Sunshine image in this challenge, next challenge, you'll get a freebie! This is Gingerbread Sugi. I colored Gingerbread Sugi with Copic markers, then used 2 sizes of a Die-namics stitched die to cut her out and back her. 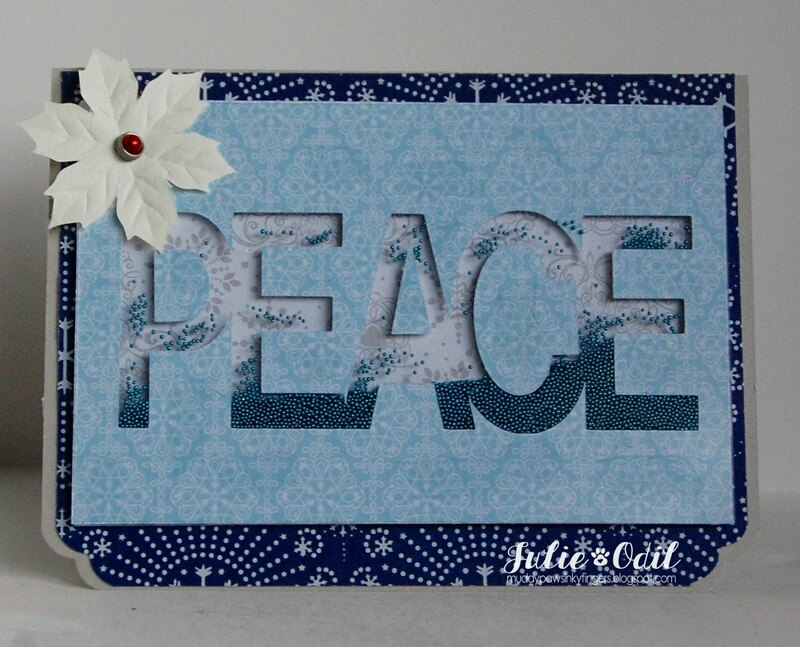 The snowflake banner die is from La La Land Crafts. All papers are from my stash, and I no longer remember what companies they are from. Sorry! Please join us for our Christmas Confections Challenge at Lacy Sunshine Challenge Blog, and stay tuned next year for loads of fun! Join our Lacy Sunshine Color and Craft Facebook Community to be the first to know of new releases, sales, and see tons of wonderful inspiration. This time, at The Cutting Cafe, the designers are featuring anything Christmas. Since I love creating shaker cards, that's the direction I went. This is probably a wish that many of us have, but this year, it seems particularly poignant. 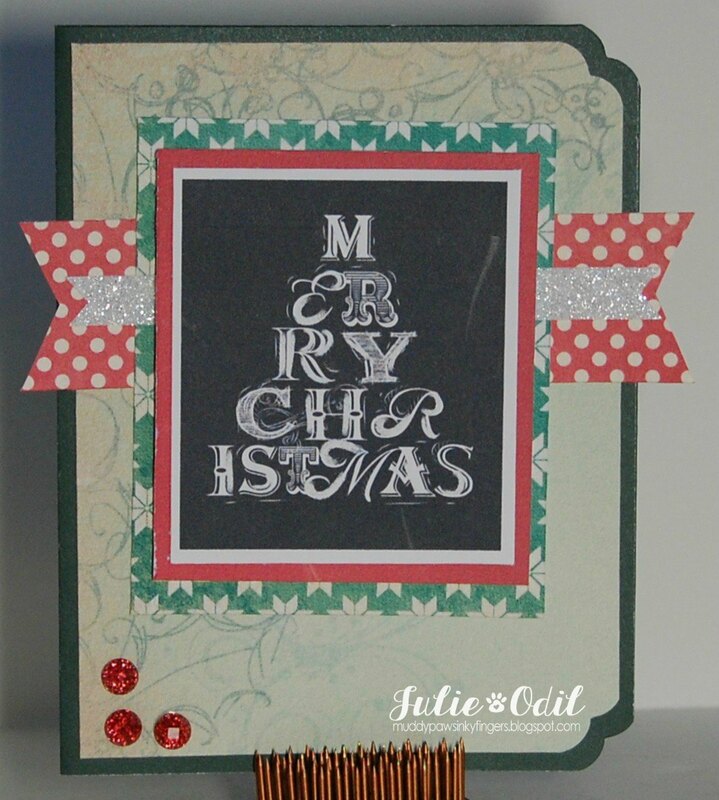 I made this card using the Christmas Word Shaker Card cutting file from The Cutting Cafe. I filled the shaker with micro beads. Papers are from DCWV. The poinsettia is from Close To My Heart. 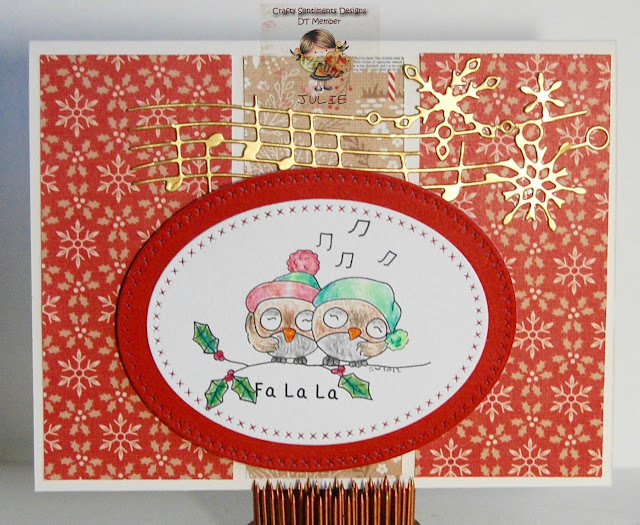 Check out the Cutting Cafe blog to see what the other designers have created with the many, many Christmas files available from The Cutting Cafe. Leave a comment on the blog on or after Dec. 21, and you could win 3 files of your choice! 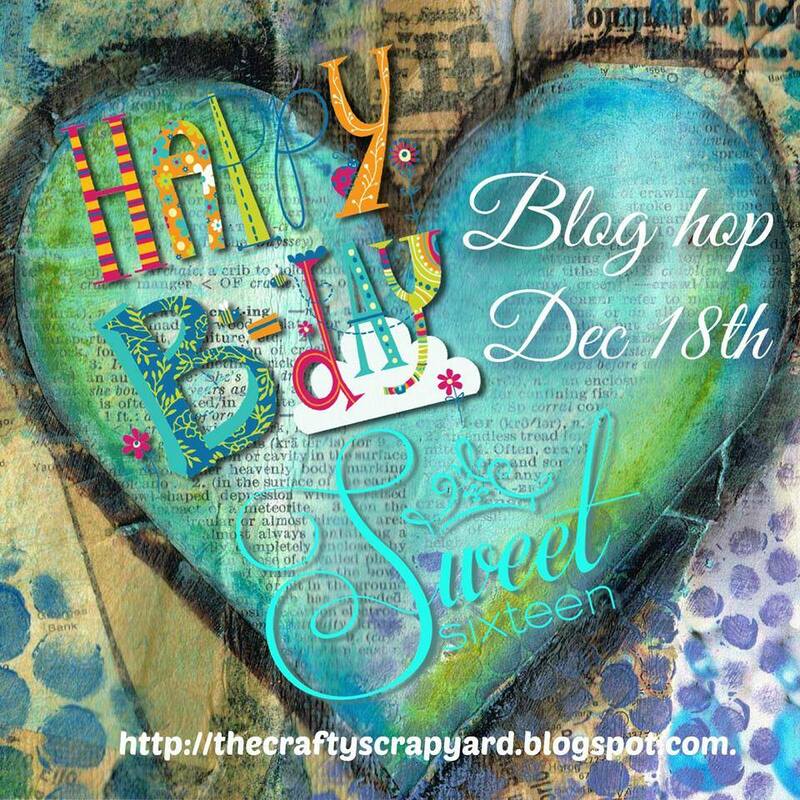 Surprise 16th Birthday Blog Hop! and blog candy! Are you looking for The East Wind's New Release? Please click HERE! Hi friends!! Thank you for joining us today as we celebrate Emily's recent Sweet 16th Birthday! Shh, it's a surprise so don't tell her!! We're so thankful you've joined us to celebrate the sixteenth birthday of a fun loving young lady. She will be blessed by your participation, designs and comments. You should be arriving from Georgia's blog. If so,GREAT if not, please check out the bottom of my blog for a complete list of the blog line-up. 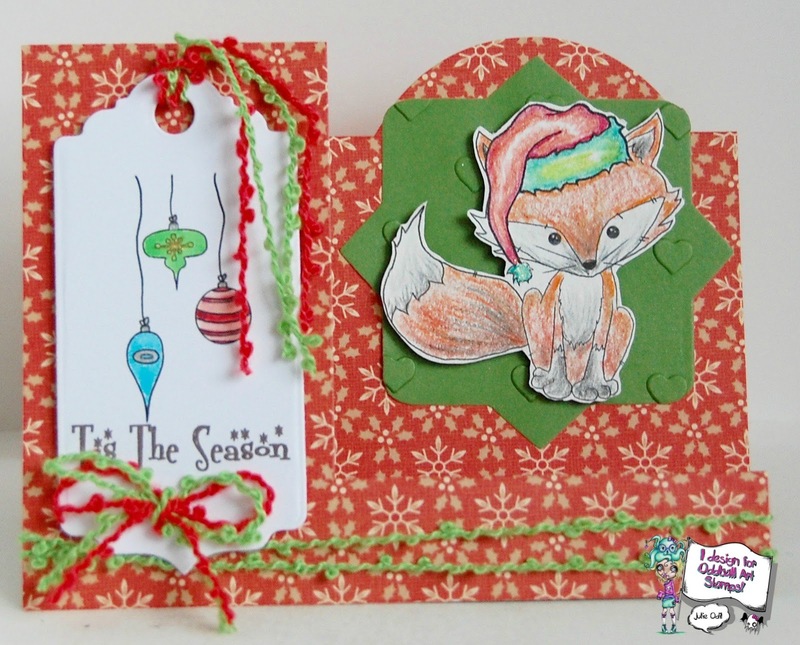 I made this card using Derwent Inktense Pencils on the fox. They are watercolor pencils, if you have never used them, and as the name implies, the are intense, using very little ink to color a large space. 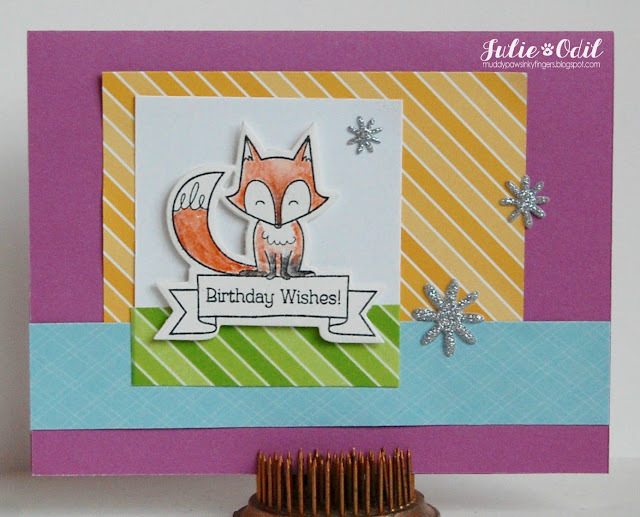 The fox and die cut, sentiment, papers and glimmer stickers are all from Close To My Heart. 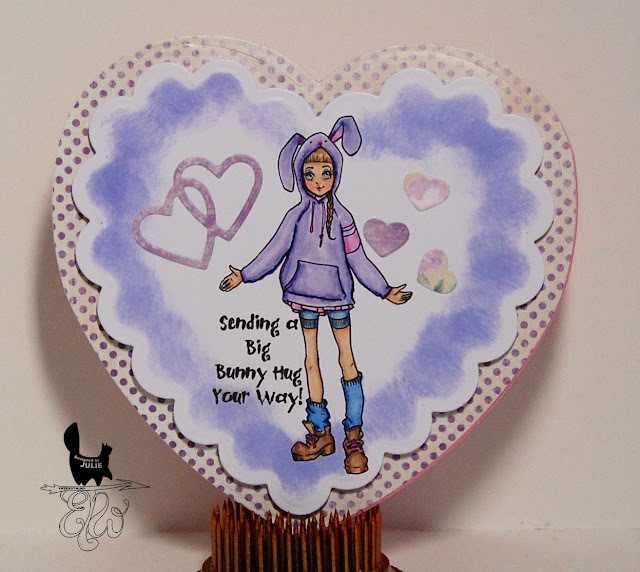 What is a blog without candy, If you are a follower of The Crafty Scrap Yard just leave a comment here along with the other blogs in today's hop and you'll be entered to win two sets of Cardz TV stamp sets! "Make A Wish" and "Girl Talk" both sets that will help you celebrate a birthday celebration or a girl in your life! "Your next stop along the hop is at the crafty Barbara's blog." Remember some of the other designers are also giving away blog candy too, so don't forget to visit everyone, read carefully and become a follower of all blogs, and leave some comment love! Here's the line-up for "Emily's Surprise 16th Birthday" Blog Hop! If you get lost while hopping come back here to check the list and find your way again! Julie - http://muddypawsinkyfingers.blogspot.com -- you are HERE! I have blog candy! 3 Girl JAM is my favorite ribbon company. I am giving one lucky winner the bundle of their choice in the 3 Girl JAM shop. To be eligible, please follow my blog and leave a comment here with a way to contact you. I would be happy if you'd also like my Facebook page and follow me on Instagram, but this is not required. Good luck, and please check out the 3 Girl JAM shop! Use discount code JO10 if you'd like 10% off all those luscious goodies you see there! I will announce the winner on Dec. 31 -- both here and on the 3 Girl JAM blog. Thanks so much for hopping with us today and wishing Beth's daughter a Happy Birthday. Off you go! Are you looking for the Birthday Blog Hop? Please Click HERE! It's Friday, and it's New Release Day at The East Wind. Today's image is called, "Under the Mistletoe". It's perfect for the cat lover on your list! 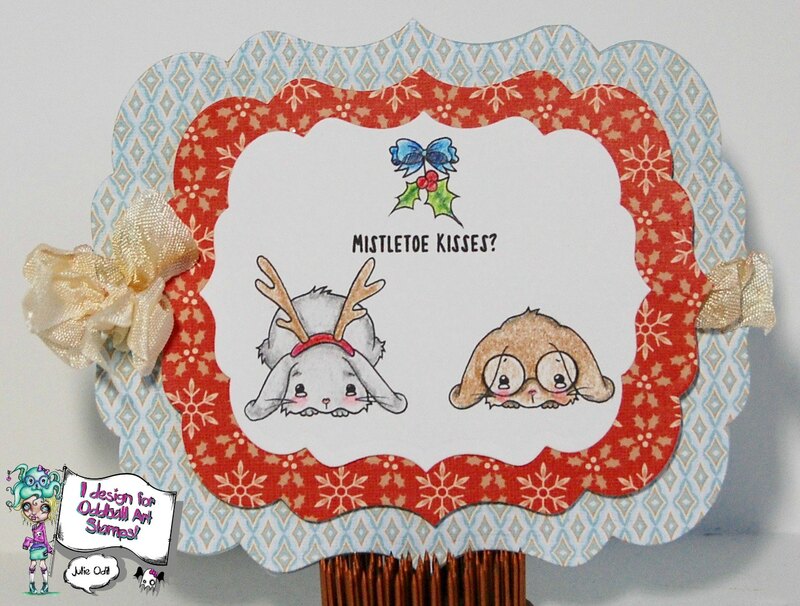 I colored 'Under the Mistletoe' with Copic markers, then used several sizes of a Lifestyle Crafts circle die set to cut it out and back it. Backing paper, card stock, and glimmer tape is all from Close To My Heart. The sentiment is computer generated. Join us at The East Wind's Facebook group to see what some of the other designers did with this same delightful image. Art by Miran is having a DT Call. Whenever I work with Mi Ran's images, it brings me joy. I have a collection of Art by Miran images, and each of them is a treasure. I have a few projects I've created with Art by Miran images, but I'm including 3 of them in this post. They are my 3 favorites, and I think they represent may style well. The above tag uses Digi 182, Punkette Peta. This card uses an image called "Gem". Each project was colored with Copic markers. I also enjoy colored pencils, watercolor pencils, and watercolor paints. I would love the opportunity to work with Mi Ran Jung's wonderful art on a regular basis! Thank you so much for looking at my blog. I'm posting today for 3 Girl JAM. 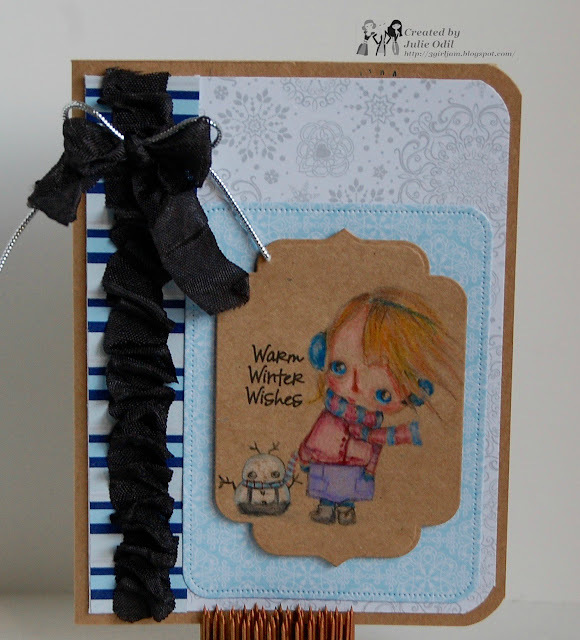 I love the way ribbons can layer together, and that's what I did on this card. The image is from Lacy Sunshine. She's called, "Rory's Snowglobe". I colored her with Copic markers. I used a Spellbinders die, cutting the same size out twice to back and highlight the colored image. Papers are from Close To My Heart. The sentiment is a stamp from The Cutting Cafe. The crinkle ribbon and jute ribbon are both from 3 Girl JAM. The cream crinkle ribbon is from the Coffee Bundle. The Jute Ribbon is part of the Jute Ribbon and String Pack. 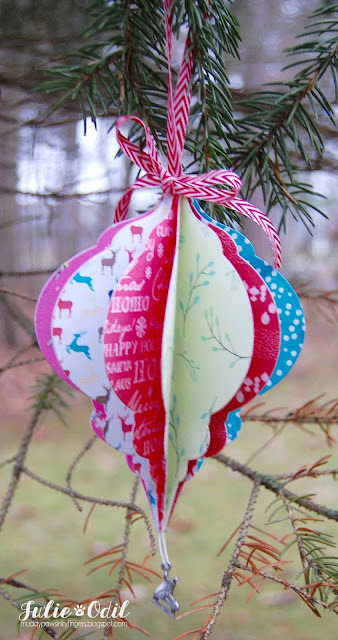 This month's "Colors of the Season plus Ribbon" challenge is going on at the 3 Girl JAM Challenge blog. Please join us! If you'd like to do some shopping for yourself, use discount code JO10 for 10% off of anything in the 3 Girl JAM shop. Christmas shopping, anyone? It's the 15th of the month, and time for some mid-month inspiration on the 12 Months of Christmas Challenge Blog. This month, our theme is "Here Comes Santa Claus". Link up a card with that theme to be eligible to win the prize from our sponsor, Rick St. Dennis. The Rick St. Dennis image is called 'Santa Cookies'. I colored the image with Lyra Rembrandt Polycolor pencils, then cut it out with a Lawn Fawn circle stitched die. Designer papers for this card are from Decosse's Dynamite Doodles. The banner dies are from Craftin' Desert Divas. 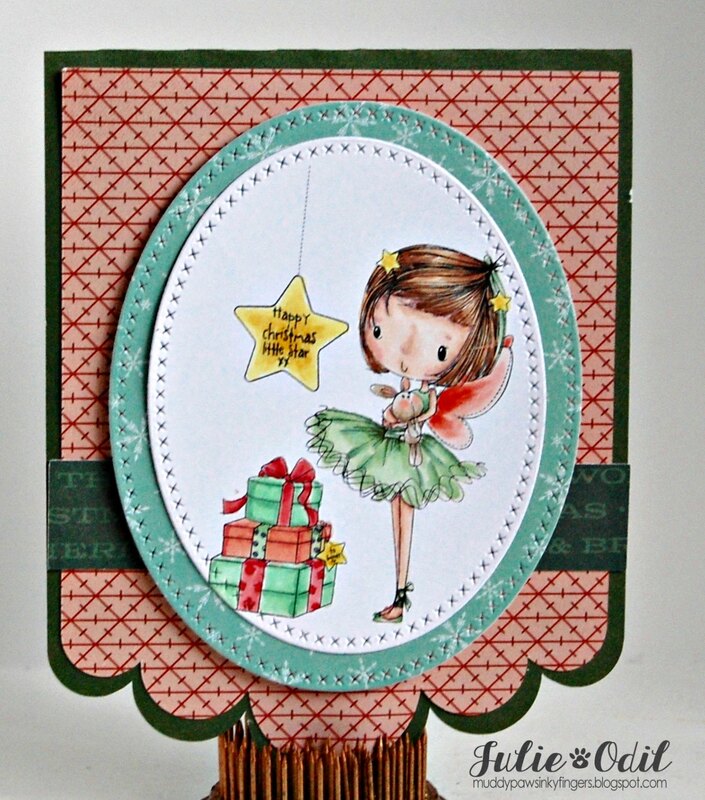 The bow die is from Lil' Inker Designs. Join us with your Christmas cards this month for a chance to win digital papers and a gift certificate from Rick St. Dennis at the 12 Months of Christmas Link Up! I used one of the cute images from the stamp, #278, Basketball Cuties. There are 2 more basketball player images, a brick wall, and some graffiti. It can be used as one large image, or the layers can be separated (as I did here), and any portion can be used. 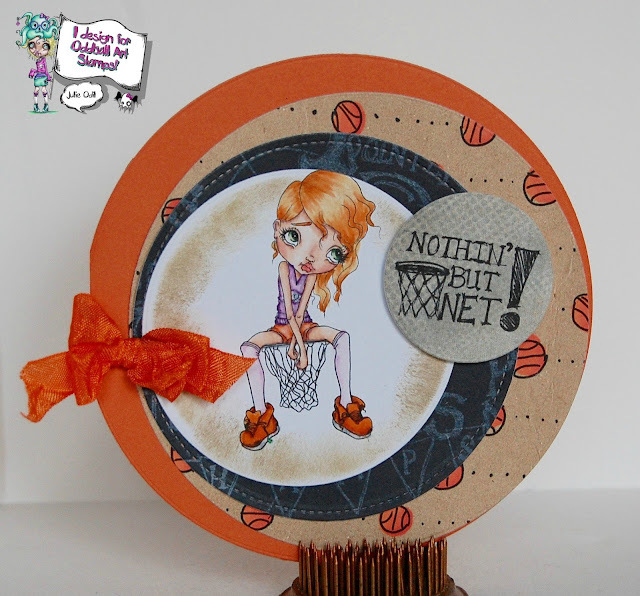 I colored the basketball cutie with Copic markers, cut her out with a Lifestyle Crafts circle die, and sponged the edges with several Tim Holtz distress inks. The sentiment and designer basketball papers were found at Pixel Scrapper and printed on my printer. A bit of 3 Girl JAM ribbon finishes off this circle card. 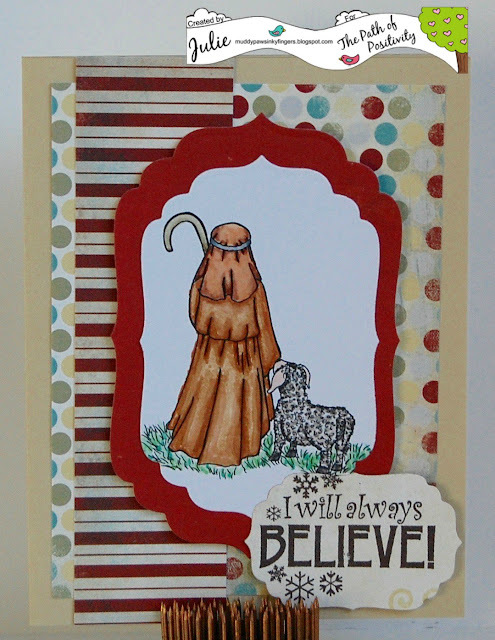 Visit the Oddball Art Stamps blog to see the other great creations from the New Release team. It will give you some great ideas of how this new release stamp can be used. It's the 15th of the month, and we're starting a new challenge at the Oddball Art Challenge Blog. This month's theme is "Christmas or Winter Holiday". The challenge will last until January 14, so you've got lots of time! 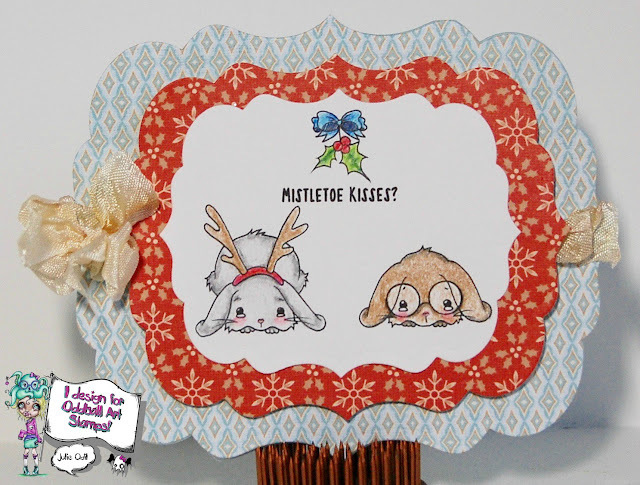 This delightful Oddball Art Co. digi, #139, Christmas Bunnies under the Mistletoe, is colored with Lyra Rembrandt Polycolor Pencils. The sentiment is computer generated. I'm not so sure these two are snuggle bunnies, LOL. I made the card shape using a variety of sizes of a Spellbinders die. The crinkle ribbon is from 3 Girl JAM. All papers on this card are from Close To My Heart. I hope you can join us this month for our Christmas/Winter holiday challenge at Oddball Art Challenge blog. 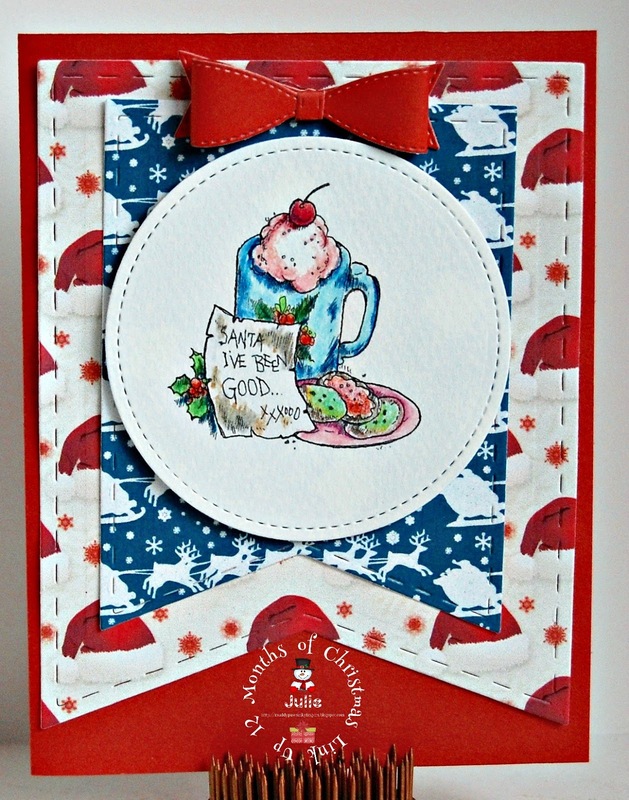 It's Tuesday, and the start of the last challenge of the year for the Crafty Sentiments Challenge blog. Our theme, which will be a 3-week long challenge, is "Happy New Year." 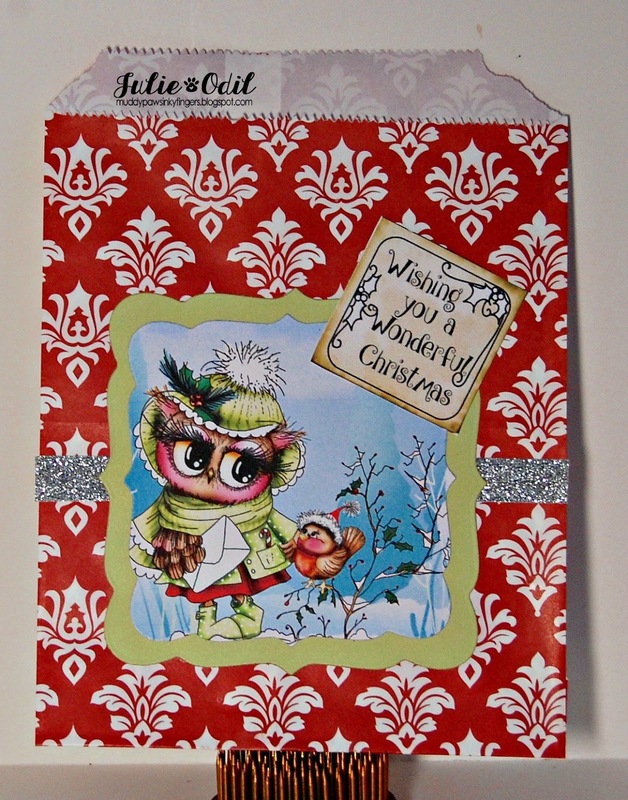 These 2 adorable owls are digi images, available in the Crafty Sentiments store. The image is "Hootie - Christmas Carol." I colored the 2 owls with Lyra Rembrandt Polycolor pencils. I used 2 sizes of an oval stitched die from Die-namics to cut out the Hootie image. The music/snowflake die cut is from Simon Says Stamp. All papers on this card are from Close To My Heart. I hope you can join our "Happy New Year" challenge, and celebrate the holiday with us at Crafty Sentiments Challenge blog. It's Tuesday, and Digi Choosday. Today, we start the last Digi Choosday challenge before we take a bit of a holiday break. This would be a good time to take advantage of the super duper discount code (say THAT 3 times fast!) and do a bit of shopping for digi products in the Polkadoodles store. We'll all have more time for crafting after the holidays. Won't we? Please? This time's theme is a favorite of many -- anything goes! We're ending the year with a bang! Most of the papers are from the Twiggy & Toots Festive Fun Collection, available in both Digital Download and CD. One of the papers, left over from a former project, but matching perfectly, is from Work & Play 5 - Festive Hollybobs. Again, this collection is available in both CD Rom and Digital Download. Our Digi Choosday 'Christmas Decor' challenge is going on for another week, so please link up with us. Then, link up with whatever your working on with the Anything Goes challenge. Woot! Show off your makes in the Digi Choosday Facebook group, too! It's Sunday, and the final New Releases of the year are in the DigiStamps4Joy Store. There are a number of beautiful ones! I printed Lil' Gypsy onto Kraft paper, then colored her with Lyra Rembrandt Polycolor pencils. I used 2 sizes of a Die-namics stitched die to cut her out and mounted the image on designer papers from DCWV. The crinkle ribbon is from 3 Girl JAM. Check out the DigiStamps4Joy blog to see the other creations from the very talented design team. You won't be disappointed! It's time for a new challenge on the Julia Spiri Challenge blog. This one will run for a month, and we are veering far away from Christmas. Our theme this month is "Dollhouse". This can be interpreted in a variety of ways, as you can see from visiting the Julia Spiri Challenge blog and seeing what other DT members did. 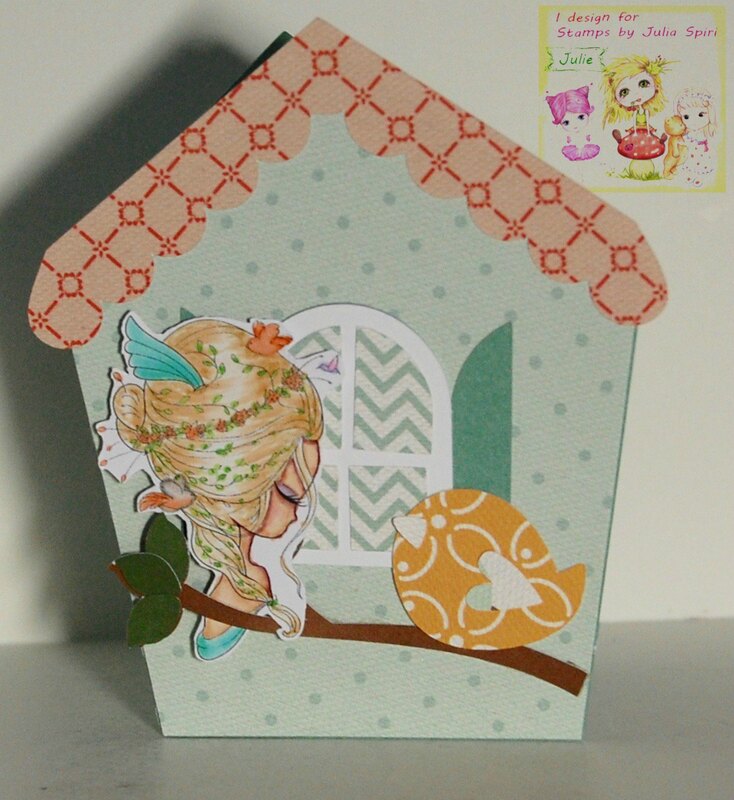 I used Julia Spiri's The Birds and Hair on this house-shaped card. I colored her with Copic markers, then fussy cut her out. The house shaped card is an SVG file from My Scrap Chick. I used the Country Village Small House Box, but chose to make it into a card instead. Papers are from Echo Park. I hope you join us this next month at the Julia Spiri Challenge Blog for our Doll House challenge. I'd LOVE to see what you make! There are New Releases every Tuesday and Friday at The East Wind. Twice a week -- that's an amazing amount of digital art to be releasing! Today's new release is so beautiful! She's called 'White Witch'. I colored The White Witch with Copic markers. 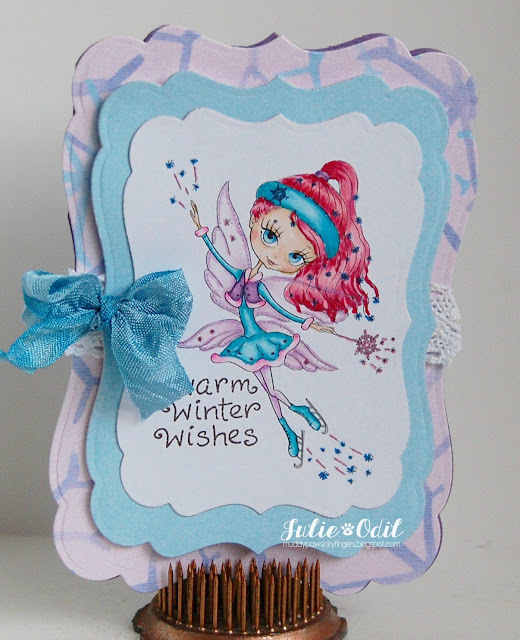 She seems like a winter fairy or princess to me, with that wand in her hand, so I used cool, winter colors on this card. I used a Spellbinders oval die to cut her out. The snowflake-shaped card is a file from the Silhouette Design Store, cut out on my Silhouette Cameo. The silver ribbon is from Really Reasonable Ribbon. All card stock is from Close To My Heart. 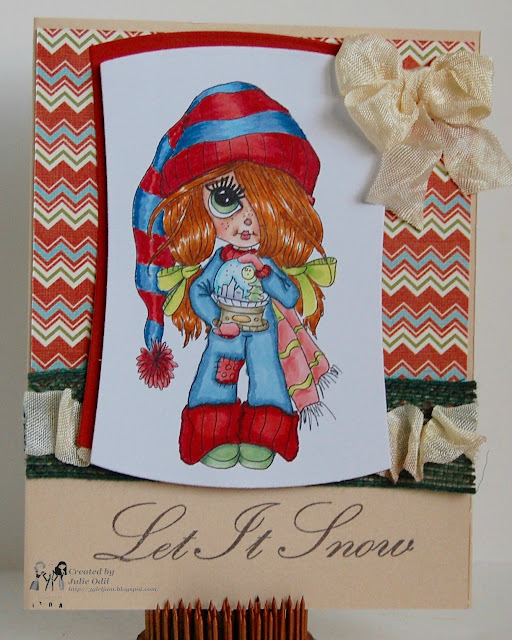 The sentiment is a clear stamp by Whimsical Designs called "Snow Much Fun". Visit The East Wind's Facebook Group to see what other design team members have done with this digital stamp, The White Witch. It's Tuesday, and that's Digi Choosday. I love this day of the week! It's time for a new challenge on the Digi Choosday Challenge Blog. It's also the day to get some really great savings on digital downloads at Polkadoodles. Do some shopping -- you know you want to! Both ornaments were created using a pre-printed image from the Twiggy and Toots Festive Fun Collection. It's available in Digital Download, and CD. 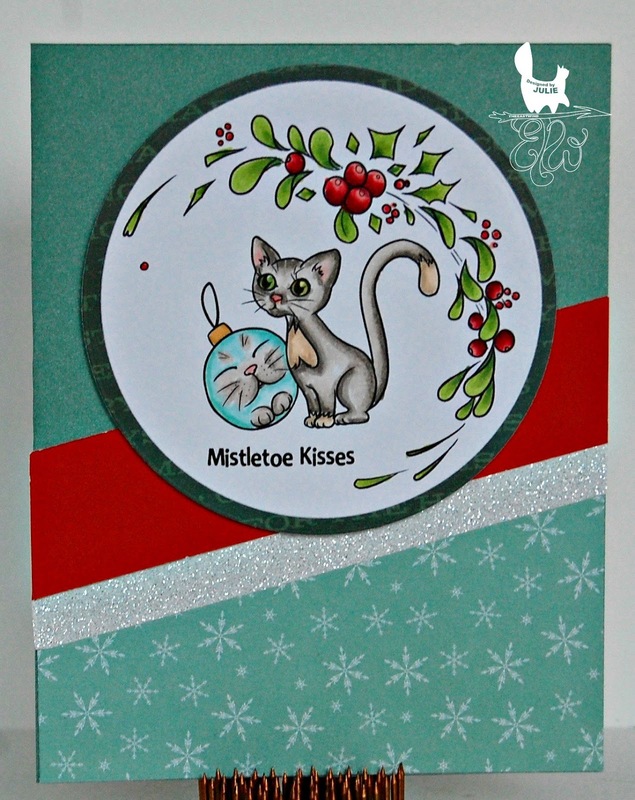 Bauble Wishes is also available as a digital stamp. The papers I used on these ornaments is also from the Twiggy and Toots Festive Fun Collection. The ornament shapes were created with Spellbinders dies. 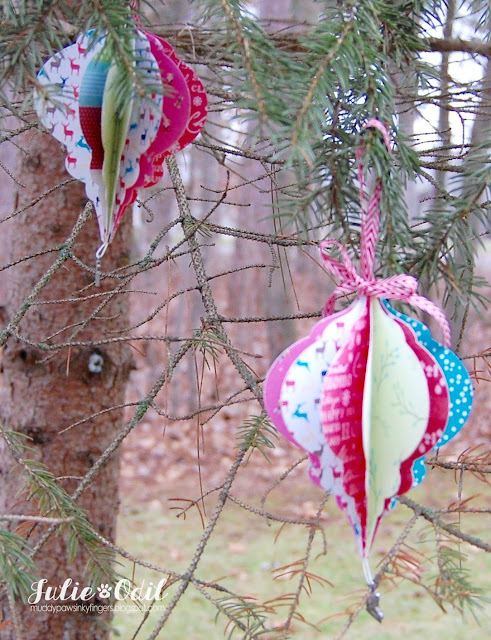 There's a bit of Timeless Twine to hang the ornaments. I used a tree in my yard to photograph these. Yes, we have snow! The 'Traditional Christmas' challenge is going on for another week at Digi Choosday, so please join us in that one, and then enter your Christmas decor projects for this challenge! I'd love to see what you make! It's time for a new challenge at the Path of Positivity Challenge Blog. This month, our theme is "Believe". We have two great sponsors this month -- Fresh Brewed Designs, and Pickled Potpourri. This digi image is called 'Shepherd'. I colored Shepherd with Copic markers, then used 2 sizes of a Spellbinders die to cut it out and mount it. I used a smaller die of the same pattern to cut out the sentiment. The sentiment is from Close To My Heart. The papers are old Christmas papers from my stash. Please join us this month at Path of Positivity for our "Believe" challenge. I'd love to see how you interpret this, and to see what you create. It's the first Monday of the month, so that means it's time for a new challenge at Not Just Cards challenge blog. The challenge runs all month, and it's always anything goes. This is Snow Fairy. I colored her with Copic markers. I created the card using Spellbinders dies. The designer papers are digi papers from Pixel Scrapper. The lace is from Really Reasonable Ribbon. The crinkle ribbon is from 3 Girl JAM. The sentiment is from Whimsical Designs. I hope you join our Anything Goes challenge this month at Not Just Cards. We'd love to have you link up. There's great prizes to win, and I'd love to see what you make! Here she is, in her green haired glory. This is Angel Boo. I colored her with Copic markers. I kept the background quite simple to show off the cuteness of Angel Boo. The sentiment is a stamp from Close To My Heart, cut out with a Spellbinders die. Papers are from my stash. Glimmer tape, card stock, and rhinestones are from Close To My Heart. I hope you can join us this next 2 weeks for the 'Angels Sing' challenge at Lacy Sunshine Challenge Blog. Use a Lacy Sunshine image, and you'll receive a loyalty program image for free next challenge! It's Friday! Hurray! I've spent the week decorating the nursing home where I work. I've seen all the tinsel, baubles, and glitter I need to see for quite some time now, so you won't see too much of it on this project for the Polkadoodle Challenge blog. A new challenge starts today, and the theme is "Traditional Christmas". Hey, that's a good theme! I like that! I used the Picknix 3 -- Nordic Winter Collection on this card. It is available in digital download for instant gratification (yes!) or in CD. The only other touches I added were a bit of shimmer tape and some glitter domes, both from Close To My Heart. I hope you can join us the next 2 weeks for our Traditional Christmas Challenge at Polkadoodle Challenge blog. Time to finish up those Christmas projects! I'm posting today for 3 Girl JAM, and I'm also announcing the winner of the ribbon bundle from the "We Love our Fans" 3 Girl JAM blog hop. This adorable image, by Lacy Sunshine, was colored with Copic markers. I used a Spellbinders die, cut once with some red glitter paper (by Close To My Heart), to back the image. Papers are from October Afternoon. The jute ribbon, from 3 Girl JAM, adds the perfect touch! Congratulations, Susan! Contact me with your mailing address and ribbon bundle choice and I'll get it mailed out to you. There's a new challenge going on at 3 Girl JAM Challenge blog -- ATG with Ribbon. I hope you can join us! Need some Jute Ribbon & String for yourself? Or other wonderful 3 Girl JAM products? Use discount code JO10 for 10% off of anything in the store! It's December 1, which means there are new releases in the Oddball Art's Etsy Store. I'm also part of the newly formed Oddball Art New Release design team, so you'll see creations from me every 1st and 15th of the month. Today, there are 8 (yes eight!) new releases found in the Etsy Store. You'll see fantastic creations of all 8 digis over on the Oddball Art blog. This first card uses image #271 -- Mr Sweets, the Fox. It is one stamp, that I chose to separate into 2 distinct images. I used Lyra Rembrandt Polycolor Pencils on the fox image, and fuzzy cut him. 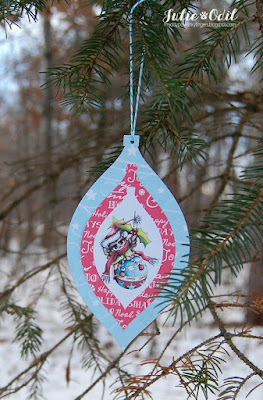 The ornaments were colored with Copic markers. The sentiment, papers, and fibers are from Close To My Heart. 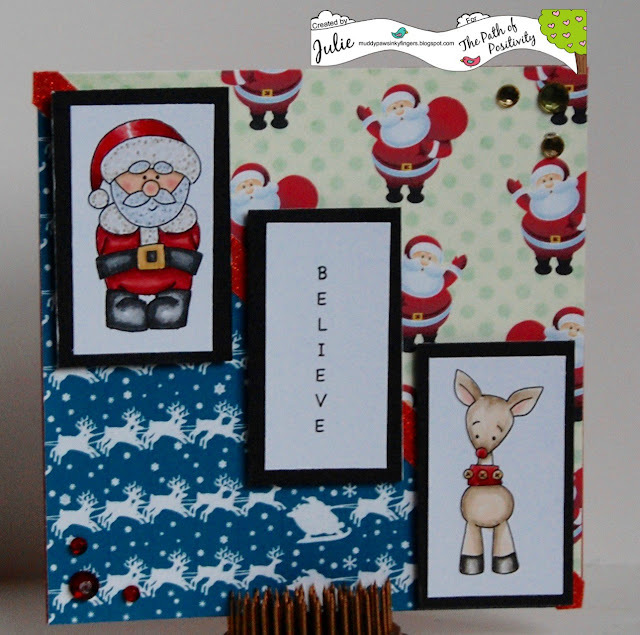 The step card was cut out using a Sizzix die. The shape behind the fox was cut with a Spellbinders die and embossed with a Close To My Heart embossing folder. This second card, image #274 -- Tilly and Sprite - LOVE to be Reindeer, was mostly colored with Copic markers. For the moon, I found a circle die (Spellbinders) the same size as the circle to use for a mask. I then covered my colored Tilly and Sprite with a piece of scrap paper so I didn't get ink on them. Using Tim Holtz Distress inks, I sponged the inside of the circle (the moon), until I got the color and shading I wanted. The sentiment is from Unity Stamp Company. 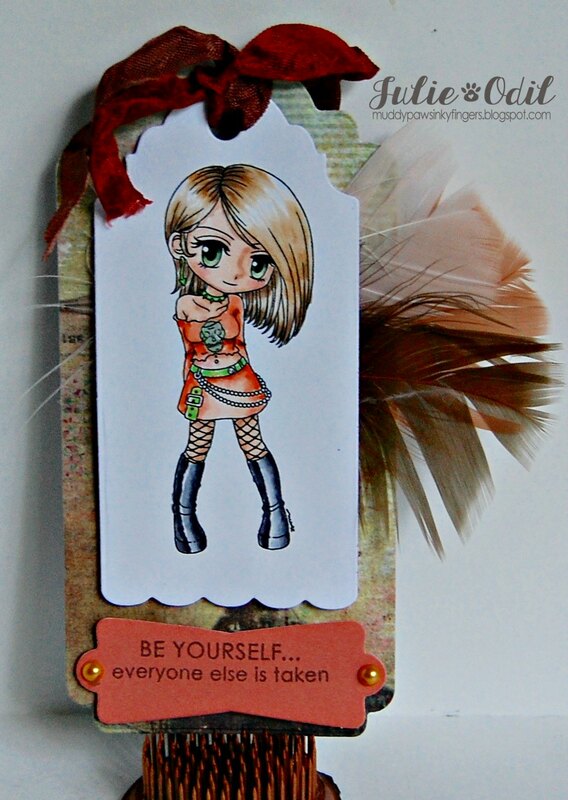 The rest of the card was created using Lifestyle Crafts circle dies in various sizes. Designer paper is from October Afternoon. Sequins are from JilliBean Soup. If you need (and you know you do!) any of today's new releases (or anything else in the Oddball Art Co. Store, please use discount code DTJULIE10 for 10% off of anything!